Her love for fashion is evident from her blog posts and to know her better on wedding fashion, we had a quick QnA round with her. Memorable Indian Weddings (MIW) – Hello Abhilasha, first question is undoubtedly, why fashion and Why Looking Good Feeling Fab blog.? Abhilasha Mehta (Abhi M) – I have always loved fashion and its ability to transform people and their personalities. When I had my daughter, I wanted to document my style for her, to maybe look back at fondly (or not so fondly) in the future and this is how Looking Good Feeling Fab happened. I had no expectations from the blog at that point, but slowly as the number of visitors grew from 0 to a few 100’s my expectations and excitement grew too. MIW – What about blogging industry which is very vast, influential and we are in its very initial stage, especially fashion blogging? Abhi M – I love blogs, and I could spend hours and days lost in them. They are such a great way to get to know people, cultures, countries, food and so much more. I really enjoy blogging, it has helped me connect with some lovely people. As far as the blogging industry goes, it has provided a lot of opportunities, for a lot of talented bloggers, to collaborate and grow with some of the biggest and brightest brands in the world. However, in India, fashion blogging is in its nascent stage and is not taken very seriously by brands. I am sure that this will change very soon. MIW – What are your future goals and what have you planned for your blog to grow further. Abhi M – I am just taking it one post at a time, trying to grab every opportunity that comes my way and cherish every bond of friendship that is created in the process. MIW – Indian Weddings are all about splurging, spending. What is your outlook on Indian wedding fashion, its do-ability, wear-ability. Abhi M – Weddings are such an elaborate and special affair, and so is wedding fashion. Weddings in each culture are so different however the essence is the same. Every girl must feel special and beautiful on her wedding day, those memories last a lifetime. Indian weddings are so bright, beautiful and fun just like Indian wedding fashion. We invest so much in our wedding outfits that they really should be reusable and recyclable, something we wear and enjoy for years to come and not something we wrap up and store for years to come. I see this changing though, designers and brides are both becoming more practical about wedding ensembles. See for example the “jacket trend”, it is such a versatile separate. When worn with a lehenga or a saree it creates a gorgeous balance of versatility and extravagance, fit for a princess or a bride. When worn with pants or a dress, it is perfect for a destination wedding or a cocktail. When worn with salwaar kameez it works for any occasion. 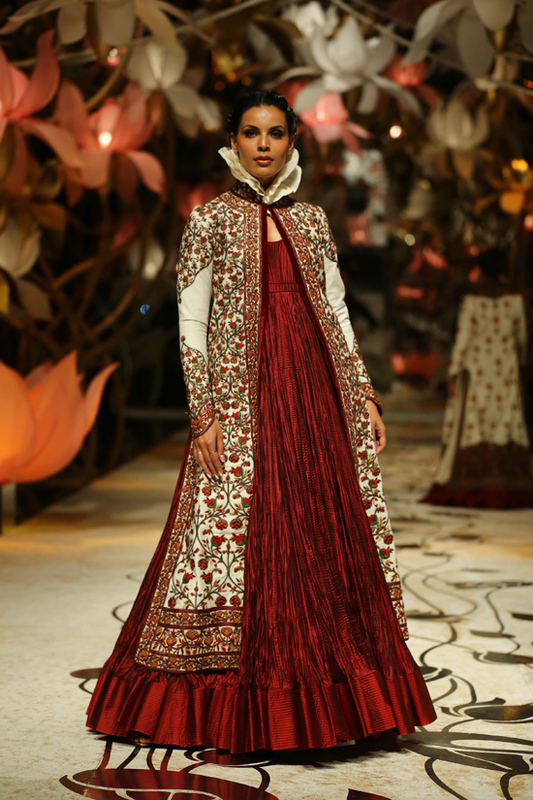 So if you are planning your trousseau or building your Indian wardrobe, a jacket is an absolute must have. Dont believe me?? Believe these pictures? 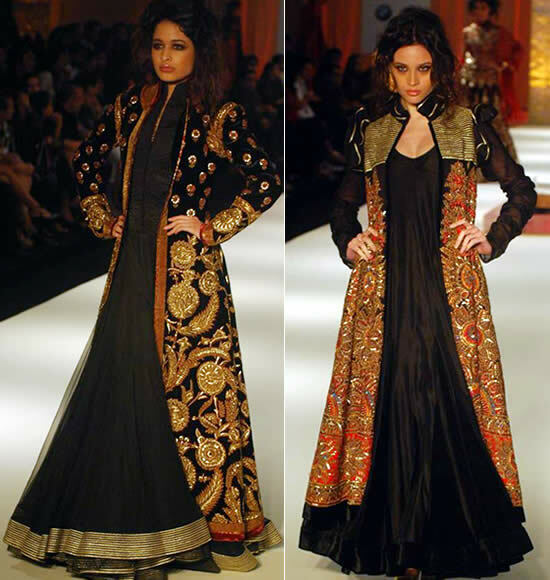 Jacket lehengas seems to be really catching up and is next trend after after the double dupatta style. Will you be sporting a jacket for your any of the wedding events?